That's a concern for Zirkander, Cas, and the rest of the Iskandians, but all Tolemek wants is to find his missing sister. The last time he saw her, their father had locked her in an asylum because of a mental illness with no cure. Now the military has taken her. What use the Cofah have for her, Tolemek can only guess, but he is certain she is in danger. He must save her before it's too late. But her fate is inexplicably tied to the dragon's, and he must find it to find her. 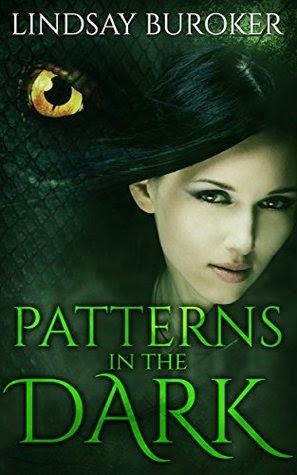 Patterns in the Dark is like reading an Indiana Jones novel. The action is nail biting the romance is apparent but kept clean and villain is a power hungry government willing to sacrifice it all for more power. Tolemek is searching for his missing sister, Zirkander, Cas, Jax, the talking sword and the rest of the gang go along for the ride because they believe the Cofah Empire are using a dragon...which originally believed to be extinct. The fate of the world, Tolemek's sister and the remaining dragon rests in the hands of AWOL pilots and a Cofah “mad scientist”. I loved it. At each and every turn, unexpected twists keep you guessing. Patterns in the Dark is a magical steampunk adventure.